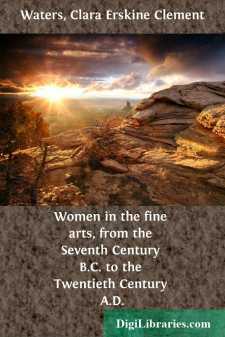 Women in the fine arts, from the Seventh Century B.C. to the Twentieth Century A.D. In studying the subject of this book I have found the names of more than a thousand women whose attainments in the Fine Arts—in various countries and at different periods of time before the middle of the nineteenth century—entitle them to honorable mention as artists, and I doubt not that an exhaustive search would largely increase this number. The stories of many of these women have been written with more or less detail, while of others we know little more than their names and the titles of a few of their works; but even our scanty knowledge of them is of value. Of the army of women artists of the last century it is not yet possible to speak with judgment and justice, although many have executed works of which all women may be proud. We have some knowledge of women artists in ancient days. Few stories of that time are so authentic as that of Kora, who made the design for the first bas-relief, in the city of Sicyonia, in the seventh century B. C. We have the names of other Greek women artists of the centuries immediately preceding and following the Christian era, but we know little of their lives and works. Calypso was famous for the excellence of her character pictures, a remarkable one being a portrait of Theodorus, the Juggler. A picture found at Pompeii, now at Naples, is attributed to this artist; but its authorship is so uncertain that little importance can be attached to it. Pliny praised Eirene, among whose pictures was one of "An Aged Man" and a portrait of "Alcisthenes, the Dancer." In the annals of Roman Art we find few names of women. For this reason Laya, who lived about a century before the Christian era, is important. She is honored as the original painter of miniatures, and her works on ivory were greatly esteemed. Pliny says she did not marry, but pursued her art with absolute devotion; and he considered her pictures worthy of great praise. A large picture in Naples is said to be the work of Laya, but, as in the case of Calypso, we have no assurance that it is genuine. It is also said that Laya's portraits commanded larger prices than those of Sopolis and Dyonisius, the most celebrated portrait painters of their time. Our scanty knowledge of individual women artists of antiquity—mingled with fable as it doubtless is—serves the important purpose of proving that women, from very ancient times, were educated as artists and creditably followed their profession beside men of the same periods. This knowledge also awakens imagination, and we wonder in what other ancient countries there were women artists. We know that in Egypt inheritances descended in the female line, as in the case of the Princess Karamat; and since we know of the great architectural works of Queen Hashop and her journey to the land of Punt, we may reasonably assume that the women of ancient Egypt had their share in all the interests of life. Were there not artists among them who decorated temples and tombs with their imperishable colors? Did not women paint those pictures of Isis—goddess of Sothis—that are like precursors of the pictures of the Immaculate Conception? Surely we may hope that a papyrus will be brought to light that will reveal to us the part that women had in the decoration of the monuments of ancient Egypt. At present we have no reliable records of the lives and works of women artists before the time of the Renaissance in Italy.